We have been informed by his son, Alexandre, that the Argentine-born conductor Carlos Païta died in Switzerland on December 19, at the age of 83. After a promising career launch, giving the South American premiere of Mahler’s second symphony, Carlos moved to Europe in 1968 but failed to settle with any of the orchestras he conducted. A Decca producer, Tony D’Amato, signed him after hearing a concert in Brussels to record for the snazzy Phase4 sonic brand. His debut with Wagner orchestral pieces became a demonstration record. 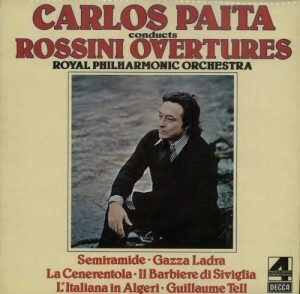 Païta followed up with further orchestral spectaculars, first on Decca and subsequently on his own label, Lodia (now defunct), mostly with London orchestras. Paita had a colourful background including a supposed connection with arms dealing. A distinguished London violinist who visited him at home in Switzerland was shown various samples of automatic and semi automatic weapons alongside his orchestral scores. He recorded a credible ‘Eroica’ symphony with the SNO. It’s well worth tracking down. I own three of his Lodia LPs: LOD 777 Berlioz: Symphony Fantastique (with the London Symphony Orchestra) which won a Grand Prix du Disque; LOD 779 Brahms: Symphony No. 1 in C minor (with the National Philharmonic Orchesta); and LOD 782 Dvorak: Symphony No. 7 in D minor. His conducting and pacing is excellent, in my opinion, and the orchestral playing is also excellent. The sound on these LPs is superlative also. These were all early digital recordings. (I believe that at least one was a reissue from Decca/London.) I do not know if any were subsequently reissued and made available as CDs. I can’t imagine that any were big sellers. The Dvorak was issued on CD, I have a copy – it is very good. It was highly praised by the c.1990 editions of the Penguin Guide, but I remember the guide also commenting on how hard (and expensive) it was to obtain. I have only ever seen two copies, both lucky finds in secondhand shops (I bought one for myself and the other for a friend). I also have a CD of his Bruckner 8 (again stumbled across secondhand) which I haven’t played for many years, I remember it being enjoyable and at 74′ it’s certainly snappy – for Bruckner. Very sad to learn of Maestro Paita’s passing. I met him during his last visit to Washington DC in 1987, when he conducted the National Symphony in the Bruckner 4th. My wife and I hosted the Maestro and Mrs. Paita at our home. A great gentleman. I always regretted that a man of such talent never made the big time. He told me that he identified more with the older generation, like Paray and Golschman. Fortunately, his magnificent recordings will preserve his great artistry. The live account on youtube of his conducting of Janacek’s Taras Bulba is quite definitive in my humble opinion. Nobody seems to bring so much peronality to every instrument’s line. Plus his distinctve feel for percusion, probably also part of his heritage from Furtwangler’s style of conducting? I have no idea on the perforance’s provenance, maybe someone else knows?